The Short Version: Sharon Pope has accomplished much in her life. She’s a certified master life coach, six-time international best-selling author, and a widely sought-after columnist whose articles have appeared in The New York Times and The Huffington Post, among other leading publications. Despite her professional success, Sharon is most proud of the strong ties she’s formed in her personal life as a wife, stepmother, friend, and caretaker of two miniature goldendoodles. It’s this varied background that makes her so effective in enacting real, positive change for her clients. Sharon draws from all aspects of her life to empower women and men to heal their intimate relationships or let them go if need be. For Sharon, it’s all about nurturing love-friendly habits to help people break away from destructive patterns and begin living the lives they deserve. Sharon Pope thought she had it all — a husband, a house in the suburbs, a good corporate job, and a pension plan. So when she found herself unhappy and lonely, she knew she had to make a change. Sharon discovered the hard way that the path to true love was a personal journey she had yet to travel. When her marriage of 11 years ended, she did what many divorcees do — seek comfort and healing in another relationship. Sharon draws from her professional and personal background to help clients strengthen relationships. Although she had a portfolio of successes in the corporate world as a CMO, Sharon only felt pangs of emptiness in her love life — moving from one relationship to the next. The distance grew between her own set of values and self-worth as she continued looking for a quick fix. “I finally stopped all the madness of dating and finding and searching and grasping and giving it all of my energy and decided to do things differently,” she said. She then took a bold step into self-discovery to elevate her life expectations. Sharon transformed her pain into passion, eventually found the love of her life, created a happy, healthy, loving, and lasting relationship, and decided to help other people do the same. Sharon has transformed her old corporate lifestyle into one that truly fits her mindset. As a certified master life coach with a practice dedicated to healing relationships, she helps clients learn to create lasting love for themselves. Her inspirational journey awakened her to a life built around her authentic self, her needs, and her desires. 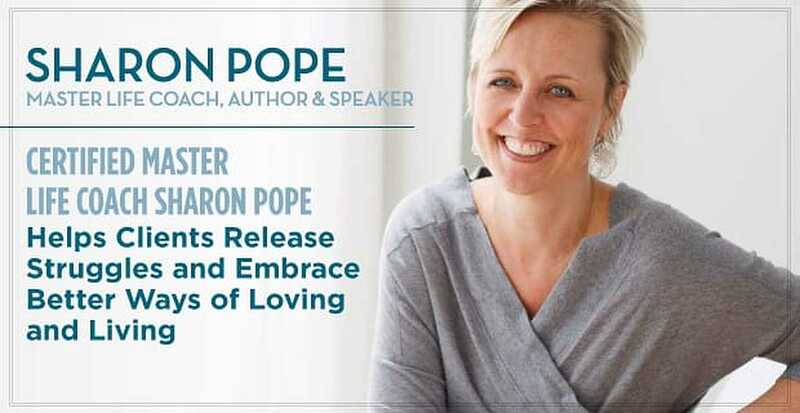 With six best-selling books under her belt and one that will be in bookstores within a month, Sharon is empowering people to reshape their lives and their most important relationships. Clients are amazed by the life-changing experiences they’ve had with Sharon through her three-month Healing from Heartbreak Program. This is a one-of-a-kind opportunity to break cycles of heartache, despair, and unsuccessful relationships. Sharon connects with clients where they are and helps them discover where they want to be. “The reason we can get so far so fast is because it’s incredibly focused work,” she said. “I think it’s way more powerful to know where you’re going as opposed to where you’ve been. The program dedicates the first month to taking courageous steps to shape the rest of a client’s life. Sharon helps create a foundation for healing and offers supportive tools to rebuild self-confidence. The second month reveals all the groundwork clients have done as they continue to gain clarity through what Sharon calls soulful truth-telling. “I picked up on this concept of soulful truth-telling, where, instead of telling the truth about what’s happening so that we can have another reason to beat ourselves up, it’s a way to become curious about why you did what you did in that relationship. It’s being soulfully honest with yourself,” she said. To date, hundreds of people have walked this pathway to enduring change. Sharon invites prospective clients to take the next step by scheduling a complimentary Truth & Clarity appointment. Prospective clients complete a confidential online application that helps Sharon learn whether she’s the best fit. The application provides a safe space for you to share struggles and what you hope to gain from working with her. This master life coach only takes a select number of applicants per month, so, if you’re thinking about signing up, it’s important to do so as soon as you’re ready for a change. Sharon’s unique coaching style shines a light on areas that are keeping clients from the love they want in life. Her empathetic approach and genuineness allow people to open up in ways they may have never experienced in previous counseling or therapy settings. She embraces individuality and provides a space for clients to grow, prosper, and heal. Sharon’s blogs and articles hone in on the advice and compassion many people need to better their lives. With each post, she takes readers through an array of relationship types and issues to show them how they can strengthen bonds with themselves, their spouses or life partners, and children. For a dose of weekly inspiration, simply sign up through her website to receive more wise words directly in your inbox. Although Sharon works mostly with women, men, like her client Peter, gravitate toward her caring, nurturing demeanor as a coach. Kim is another client who worked with Sharon. She noted just how effective Sharon was in helping her figure out who she was and what she wanted out of life. Sharon has authored books that feel tailor-made to any woman or man who has experienced the despair and heartache caused by failed relationships. The book series’ topics range from making marriage work to releasing a former lover and navigating a divorce. Her latest book, “Why Isn’t This Marriage Enough?” hits bookstores in December 2017. Through a special pre-order, fans can download the other books in the Soulful Truth Telling series for free. The testimonials section on Sharon’s website is chock-full of reader comments on how her books have helped them overcome hardships and understand their feelings on their relationships. Sharon continues to share her wealth of knowledge and experience through online publications, such as The New York Times, Huff Post and Thrive Global. She is also very active on social media and makes herself accessible to followers on a regular basis. She’s inspired so many people around the world to raise the bar of expectations and to look deeper inside themselves for strength and security. One of her greatest tips she shares with single people looking for love is to make dating a fun. Sharon encourages those who want true love to trust in their ability to stand in their own greatness, and she noted that there’s no other profession in which she’d rather work.